We have six 4-acre PACIFIC COAST BEACHFRONT PROPERTY STARTING AT $60,000. We’re offering some of the most gorgeous beachfront and ocean view property available along the Pacific Coast — at the best prices in the area. This is untamed, ancient land – almost holy in its solitude and natural beauty. An incredible place to build or land bank as an investment. Only 45 minutes northwest of the capital city of La Paz. 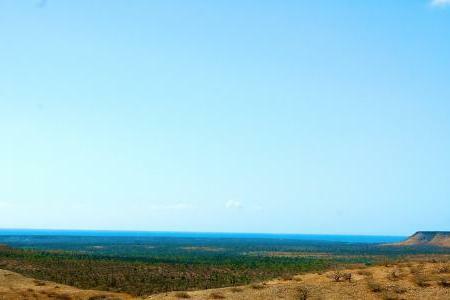 LARGE PARCELS OF PRISTINE LAND WITH OCEAN VIEWS starting at $2,500 per acre. This is one of the last unspoiled areas along the Pacific Ocean. 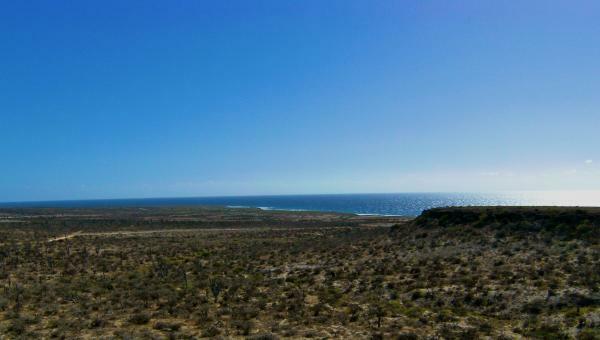 Baja Dream Properties is offering 7 large, ocean view parcels from 50 to 350 acres each. Or you can send us a message and we’ll reply asap! 150 acres, starting at $2,500. 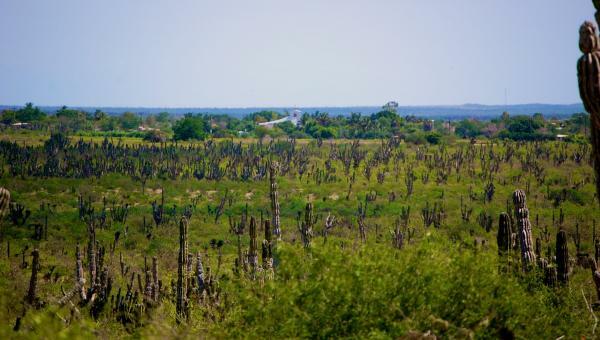 This is flat land ready to build with views of the Pacific Ocean, near the town of Conquista Agraria and water. Sturdy beach roads go straight to ocean. Only 10 minutes to Hwy 1 and 45 minutes to La Paz and the international airport. 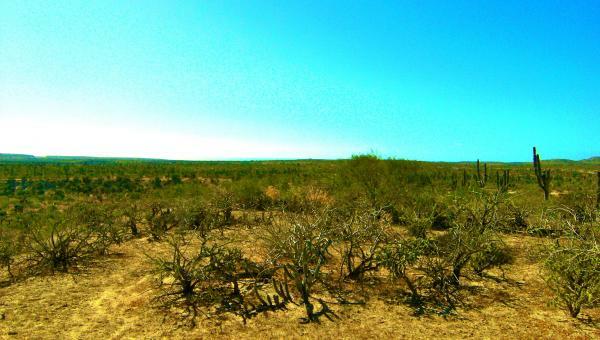 50 acres with view of Pacific Ocean, close to the town of Conquista Agraria and water — starting $2,500 an acre. This land is ready to build with access to town, flat land, goregous views and only 45 minutes to La Paz and the international airport. 110 Acres with Ocean Views next to Beach lots — starting at $2,500 an acre. This parcel runs along the edge of the beach lots offering incredible ocean views, lots of land, near Hwy #1. Just minutes from the beach, 220 acres with ocean views starting at $2,500 per acre. This parcel is close to the beach and close to Hwy #1. Only 45 minutes from La Paz and the international airport. 230 acres with ocean views and power, starting at $2,500 per acre. The Mexican government brought in power to the area a few years back – including this parcel. Power poles skirt the edge of this 230-acre parcel and then cut through the tip of the property toward the beach. 350 acres, majestic plateaus, ocean views, sturdy roads lead to the beach. Starting at $2.500 an acre. 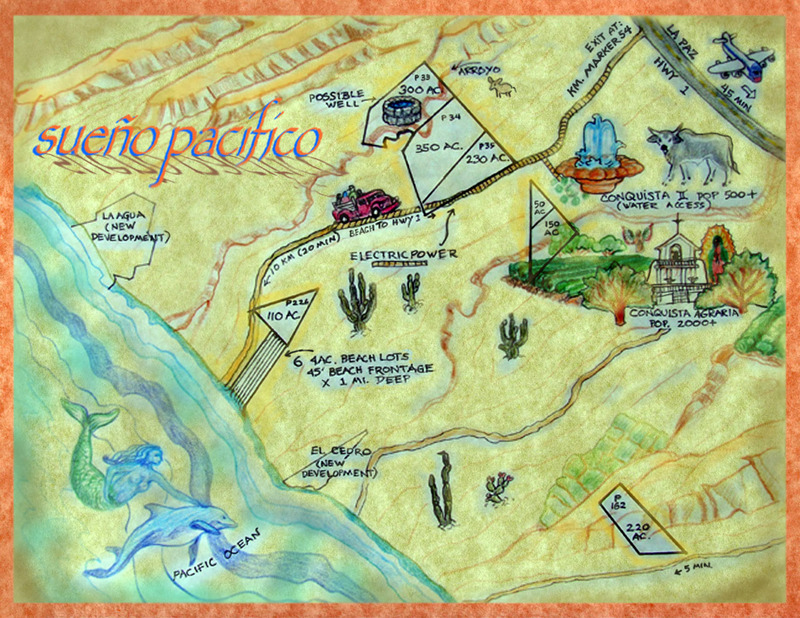 Only 15 minutes from Hwy 1 and about 45 minutes from the city of La Paz and the international airport. This is unspoiled land, beautiful and affordable with views of the pacific ocean. 300 acres of gorgeous ocean view property with water available starting at $2,500 an acre. An arroyo runs through this property! And the Mexican government brought in nearby power. This parcel has all the amenities — beautiful view, pristine land, the possibility of a well, beach access, and only 15 minutes from Hwy 1. La Paz and the international airport is about 45 minutes away. More than 90 feet of pristine beachfront property is available with the purchase of two, side-by-side four-acre parcels. This is the way to go if you want to take advantage of owning our only side-by-side beachfront lots. Buy them both and double your slice of paradise. 8 acres, almost a 100-feet of beachfront property for $120k. This beachfront property – like all of our Pacific Coast property is fully deeded, owned outright, and already secured with US Title Insurance. We’re offering this 4-acre property for $60k. About 15 minutes from Hwy 1, less than an hour from La Paz and the international airport. Water available. Power nearby. The price is incredible and the option of owner financing sweetens the deal. This beachfront paradise is $60k. Four Acres, more than 40 feet of beach, one mile deep, dotted with Cordon cactus. Sturdy roads, less than an hour from La Paz.